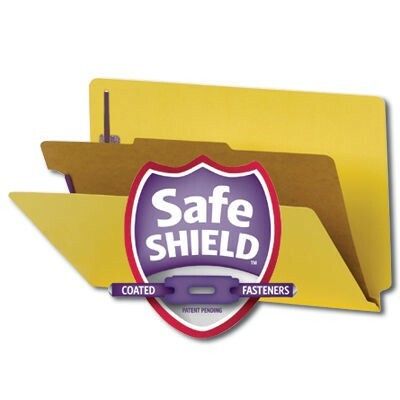 Smead 26889 Yellow End Tab Pressboard Classification Folder with SafeSHIELD Fasteners, 1 Divider, 2" Expansion, Letter. Protect your documents and fingers with Smead's patent pending SafeSHIELD Coated Fastener Technology -- the ultimate solution to fastener issues, including paper tears, finger cuts, and excessive fastener crinkling. Create a file within a file. Dividers with tabs and fasteners on both sides let you store information under several subdivisions, and fasteners on the front and back panels. Packed 10 per box. Limited Quantities at this price!